Close proximity to other humans and occasional delays are annoyances presented by any major city's public transportation system, but San Francisco's BART and Muni can seem especially exasperating. Considering the recent shutdown in service, we at Survata were interested in whether Bay Area residents are satisfied with their public transportation system, and how that compares with other major metro areas across the country. So, we surveyed 13,867 people residing in some of the most populous cities in the country using our consumer survey service. We asked them "How satisfied are you with your city's public transportation system?" 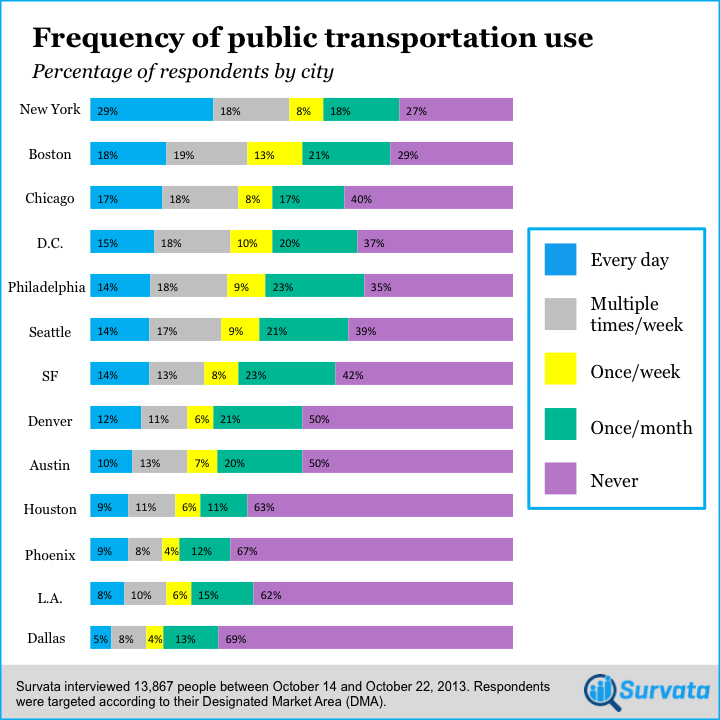 We also asked respondents how frequently they use public transportation, and as expected, found that the results differed widely by city. 29% of people in the New York City metro area use public transportation every day, compared to just 8% of those in Los Angeles and 5% of those in Dallas. We were curious if satisfaction would differ among frequent public transportation riders. The results showed that those using public transportation at least a few times per week were 56% more likely to be satisfied with their city's public transportation system than those using public transportation less often. Among frequent riders, we found that those in the San Francisco Bay Area were the least satisfied, as only 12% of respondents answered they were "extremely satisfied" with their system. One obvious caveat is our survey coincided with the BART strike in the Bay Area, and might have reached Bay Area public transportation riders at their most frustrated. However, we figure that if public opinion of a transportation system fluctuates so significantly, it probably doesn't bode well for its overall user satisfaction. Plus, some of us in the office have seen live chickens on Muni so we weren't exactly blindsided by criticism of San Francisco's public transportation. Want to gauge consumer satisfaction for your own product? Try Survata today.